If you are looking for a non-profit (unpaid) internship with the opportunity to learn a lot and contribute to the utterly unique and dynamic national organization that is World Can’t Wait, get in touch right away. Email debrasweet@worldcantwait.org with “Internship” in the subject line. Write what you think of World Can’t Wait’s mission and our plans, particularly around abortion rights. Enthusiasm is much more important than experience! 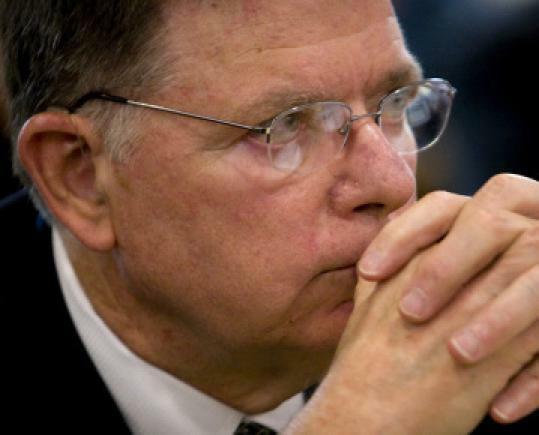 Dr. George Tiller was killed almost a year ago, on May 31, 2009. His murder, for World Can’t Wait, and others, brought a renewed commitment to stand up for women, and build a movement to stop the spreading attacks on abortion & birth control. * Nebraska has criminalized abortions after 20 weeks — that’s before viability! This law, which is in direct violation of Roe, is designed only to stop Dr. Leroy Carhart from working in Nebraka. It will be challenged in the courts — but it could also be the basis for the Roberts Supreme Court to overturn Roe. * In Oklahoma, women seeking abortions will now be forced to undergo an intrusive vaginal-probe ultrasound while viewing the fetus and hearing it described in detail. * Arizona now prohibits all private and public health insurance plans from covering abortion care — depriving thousands and thousands of women of the insurance coverage they currently have. It is not at all unlikely that Roe v. Wade, the Supreme Court decision allowing abortion in 1973, will be overturned soon, leaving states to make their own laws. In about 40 states, that would mean no, or decreased, legal abortion. On July 17, a rabidly fundamentalist sect of anti-abortion fanatics called “Operation Save America” is calling on anti-abortion forces to “storm the gates of hell” at a women’s health clinic in Charlotte, NC. Operation Save America has a long and vicious history of opposing women’s right to choose, fighting against gay rights, and spreading vicious anti-Muslim hatred. They must be opposed. World Can’t Wait is calling for people to converge on Charlotte to defend women’s reproductive rights, and oppose Operation Save America. No to fundamentalist fascists who want to impose their Dark Ages morality, their anti-gay hatred and religious bigotry on society! No to false and anti-scientific claims that abortion harms women! No to threats and violence intimidating those who heroically provide women with the right to control their bodies and their own lives. We seek to unite with a broad array of pro-women’s rights and human rights forces and individuals; that’s where we need to be seeking “common ground” and common cause-not with people who want to control women and promote violence against their healthcare providers! Contact World Can’t Wait to find out more about this mobilization-and mark the week of July 17th on your calendar to be in Charlotte, NC to defend women’s rights, and defend clinic access! Abortion is not murder-a fetus is not a baby-women are not incubators! Abortion, Morality and the Liberation of Women, featuring a discussion between Dr. Susan Wicklund, author of This Common Secret: My Journey as an Abortion Doctor and Sunsara Taylor, writer for Revolution newspaper will be screened at the Mid-Atlantic Women’s Studies Association Conference this June. Women and the Politics of Possibilities: What Have We Made Possible, What Can We Dare to Do? Friday, June 11, 2010, 8:00 a.m. to 6:00 p.m.
Order your copy of the film today! Learn about and share the long history of abortion and birth control at artist Heather Ault’s website 4,000 Years for Choice. Designed to educate and inspire, Ault has sent hundreds of postcards to clinics around the country besieged by the anti-abortion movement, and collected an impressive historical timeline that properly places abortion into its context as a human practice found in every civilization. You can even buy poster versions of her beautiful postcards! Heather is also the editor of World Can’t Wait’s film Abortion, Morality and the Liberation of Women. Some science: PZ Meyers, atheist blogger and biologist at the University of Minnesota, has this blunt and frank appraisal of all the talk of granting the “right of personhood” to embryos in An Embryo is Not a Person. Abortion Empowers You! Anti-abortion ads appearing in NYC subways claiming “Abortion Changes You” are being corrected with these awesome stickers, setting things straight: Having a child against your will changes you! On Monday December 21, we’re sending a petition to the Attorney General of Nebraska against investigations the anti-abortion group Operation Rescue is demanding on Dr. Leroy Carhart’s practice. 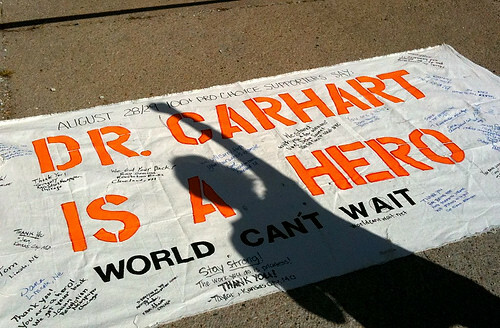 Dr. Carhart, who worked with Dr. George Tiller for years before he was killed in May, is determined to carry on Dr. Tiller’s work of providing later term abortions for women around the U.S. He announced earlier this month that indeed, he is performing abortions at 22 to 28 weeks in his Omaha clinic, and later if there is medical necessity. This is at tremendous risk for himself and his family, and of tremendous benefit for the women who, without Dr, Tiller, were not getting the care they needed. The goal is 1000 signers by Friday December 18. If you haven’t signed yet, you can now. Please ask your friends and colleagues to sign and circulate it. Put it on your FaceBook, your blog, and please send the link around quickly! We don’t expect the Attorney General, who is anti-abortion, to back off from one petition. But everyone involved should know this is a two-sided battle. Friday, January 22nd counter-protest to the March for Life in front of the Supreme Court. January 2010: The 30 minute film, “Abortion, Morality and the Emancipation of Women” with Dr. Susan Wicklund, author or This Common Secret: My Journey as an Abortion Doctor, and Sunsara Taylor, writer for Revolution newspaper will be available for campus showings.